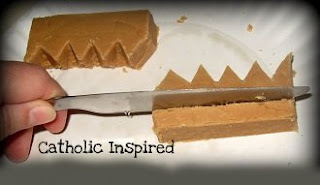 I can be a stingy mother when it comes to sugary foods, so peanut butter fudge is a rare treat for my kids! But on the feast of The Coronation of Our Blessed Mother (as well as other major feast days) I'm much more giving with the unhealthy snacks! 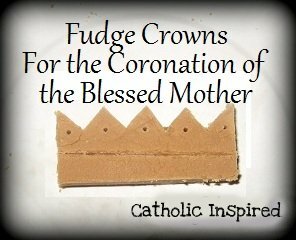 ;-) For the feast of Mary's Coronation I use our PB fudge to make "golden" crowns for Our Blessed Mother! Add sugar, milk, and butter into a large sauce pan. Mix together and bring to a boil. Boil for 3 minutes, stirring as it boils. Remove from heat and add the peanut butter and marshmallow cream. Stir until it is creamy and well mixed. (but don't take too long or it will turn bumpy) Pour into a greased 13X9 inch pan. Allow it to cool. When it's firm it's ready to cut. You will need a knife and a toothpick. Use a knife to make a zig-zag line down the middle of each rectangle. Use the flat edge of the knife on each point so it cuts all the way through in every area. Use the knife to put a small indentation on each crown. 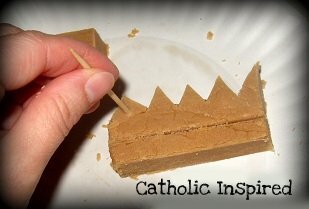 Use the toothpick to make an indentation on each point. That's it!! In no time at all you'll have a yummy plateful!! Enjoy your day as you celebrate the queenship of our wonderful Heavenly Mother! Thanks, Jen and Patty! Hope you both have a great week! Blessings! 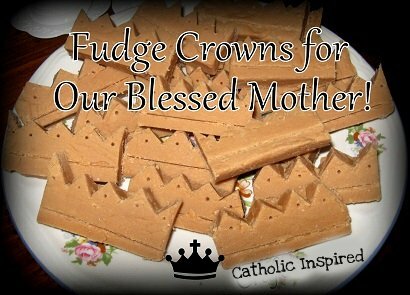 How perfect that the recipe sounds "heavenly":) Another great idea, Jennifer! Thank you! LOL!! "heavenly"! LOVE IT!! Thanks for your fun comment, Tiffany! ;-) May God Bless you! You are so amazing...I love this! 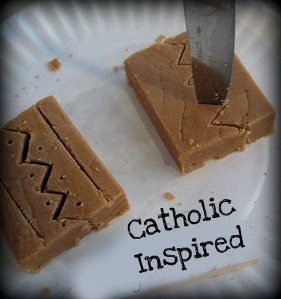 I just saw Patty's (commented above) fudge that they made today using this idea. It turned out great- we are on for next year! Thanks for sharing. 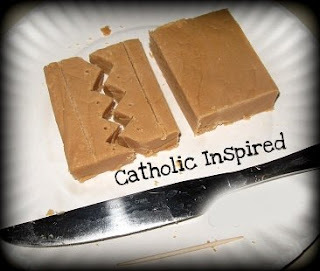 September Feast Day Fun and a Link-up!! Our Lady of Snows ~ Super Easy Art Project! Our Lady of Snows ~ "COOL" Snow Science Fun! Our Lady of Snows Feast Day ~ Snow in August! !